In my teens, the art of Mike Mignola was a hard sell for me. Admittedly, I categorized him as one of the “weird” artists––where Mignola was joined by the likes of Jae Lee, Brian Stelfreeze, Sam Kieth,Larry Stroman, Bill Sienkiewicz, and Dave McKean––that is, artists who didn’t follow the norm of Jim Lee-styled superheroics and, as a result, were rebuffed of my attention. However, Mignola stands out from those other artists in that I came around to his style earlier than many of the others. Though he didn’t draw in the highly-rendered hyper-realistic style of the Jim Lee school of comic art, his blocky, high-contrast approach to covers and interiors retained the heightened melodrama that I enjoyed with more mainstream art. 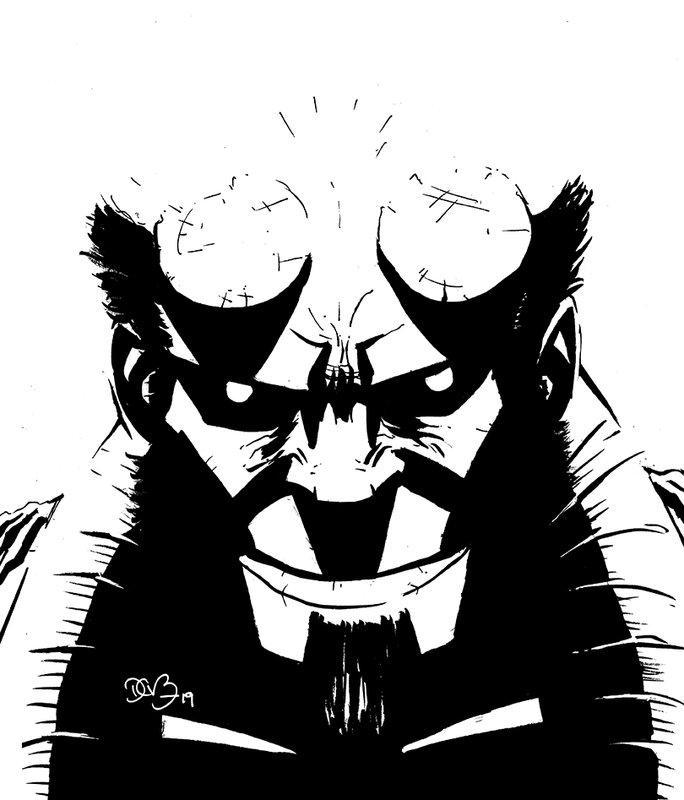 Hellboy as drawn by Mike Mignola. To that end, I did immediately respect Hellboy when it first appeared. 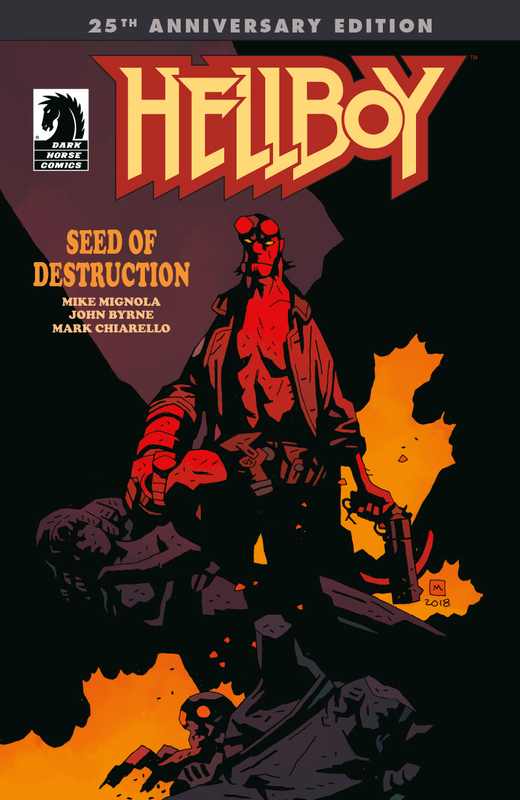 Though I probably overestimated its value as I compared it to the more mainstream work of Marvel’s X-Men books and their Image Comics clones in WildC.A.T.s––so, I lumped Hellboy into the comics-as-art (to my teenage brain) pool populated by Concrete, Love and Rockets, Cerebus, and even Bone (admittedly, my scope on the medium was rather myopic as a youth). 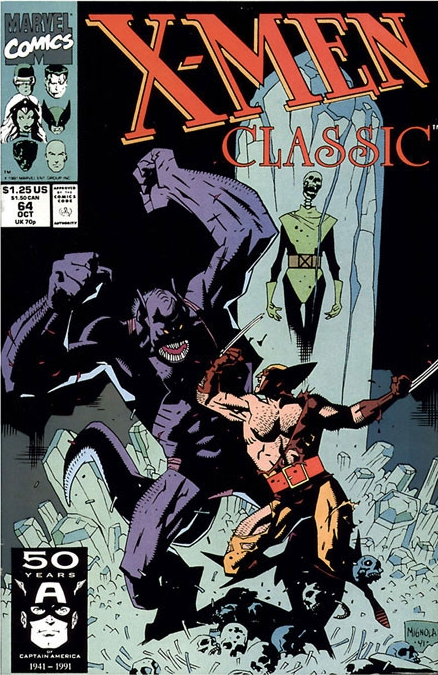 Probably my earliest exposure to Mignola, his cover work on the X-Men Classic reprint books. Now, I find myself following the abstracted leads of art like Mignola, drawing from their stylized compositions to find new and interesting ways to present not only my own characters, but my art in general. It’s due, in part, to Mignola’s work that Long John volumes 1 & 2’s covers are the way they are. If not a direct inspiration, learning to respect the work of Mignola and his “weird” kin really opened my eyes to the possibility of comic art and finding inspiration beyond those whom I simply wanted to emulate or aspire to. In fact, following these esoteric trails pushed me to change my goals and find new, personalized, and unique paths to travel down. After struggling to find mainstream work in the early nineties––he hit some high notes with things like World of Krypton and Gotham By Gaslight for DC Comics as well as drawing the Rocket Raccoon limited series and a lot of cover work for Marvel––he found a home with Dark Horse Comics that gave him the platform to literally make a comic about whatever he wanted. As noted in many interviews, he said that he knew he liked to draw monsters and so he created a book that allowed him to do just that (which also shows why he and Guillermo del Toro got along so well). 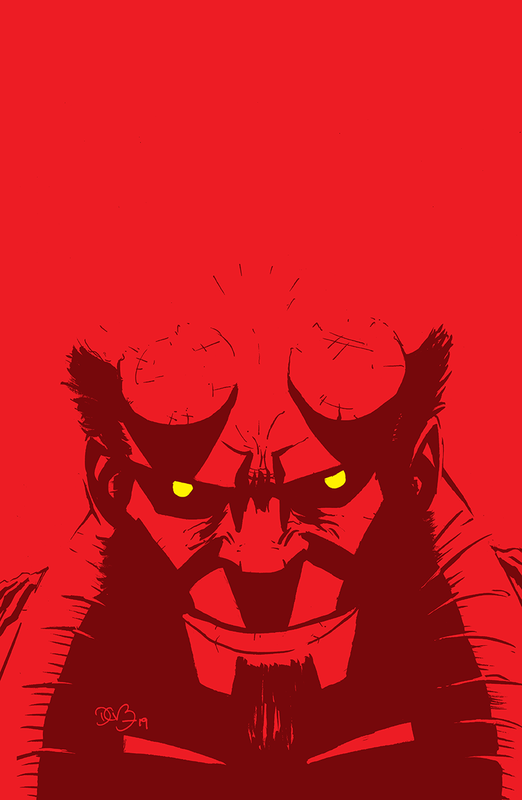 Twenty-five years later, Hellboy is probably the most well-known independent comic book creation in popular culture. So, a victory for Mignola and Hellboy is a victory for all independent creators. Lineart of this week’s Sketch Friday. My wife and I have realized that––to us––the most perfect place on the planet is the Eastern Sierra Nevada. One clue to this would be that this is where Long John takes place. A further clue (or clues) would be that we keep returning to the region between one to times a year for the last few years. Originally, we tried to write-off the excursions as “research” for the comic, but that auspice quickly fell away (although every return trip proves to be more and more useful for the telling of Long John). We’ve been there while it’s dry and hot and we’ve been there while it’s been shrouded in snow and ice––we basically got cars with four-wheel drive or all-wheel drive for the express purpose of traveling out there (though we won’t admit it)––and no matter the season it has been a wonderful, trying, adventurous, and relaxing experience. The Spring Break of my day job as a professor luckily always falls on our anniversary. So, since being hired at my current institution (or, at least, since becoming full-time at my institution) we have made a concerted effort to go somewhere for our anniversary/Spring Break every year. 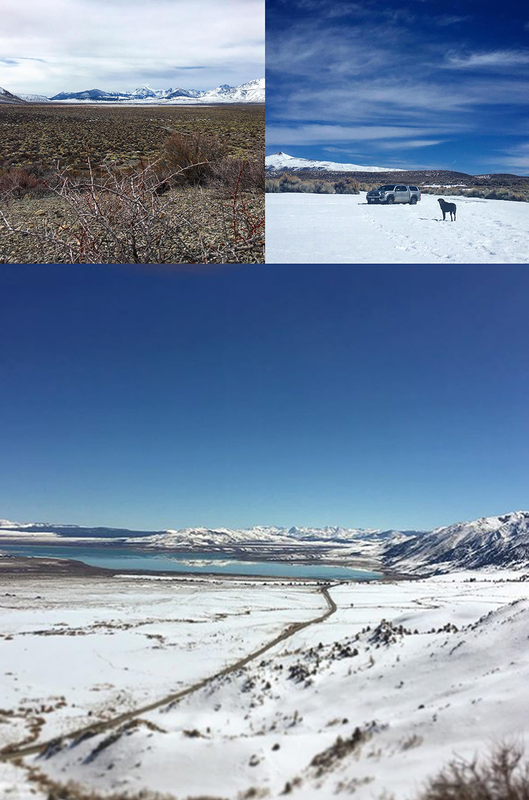 Pictures from this year’s vacation to the Eastern Sierra Nevada. This year, we decided to make an official anniversary trip to the Sierra Nevada, staying at a cabin on Convict Lake before spending some time outside of Genoa in Nevada. As is the case with every trip we take, we––or Nicole, rather––makes big plans. 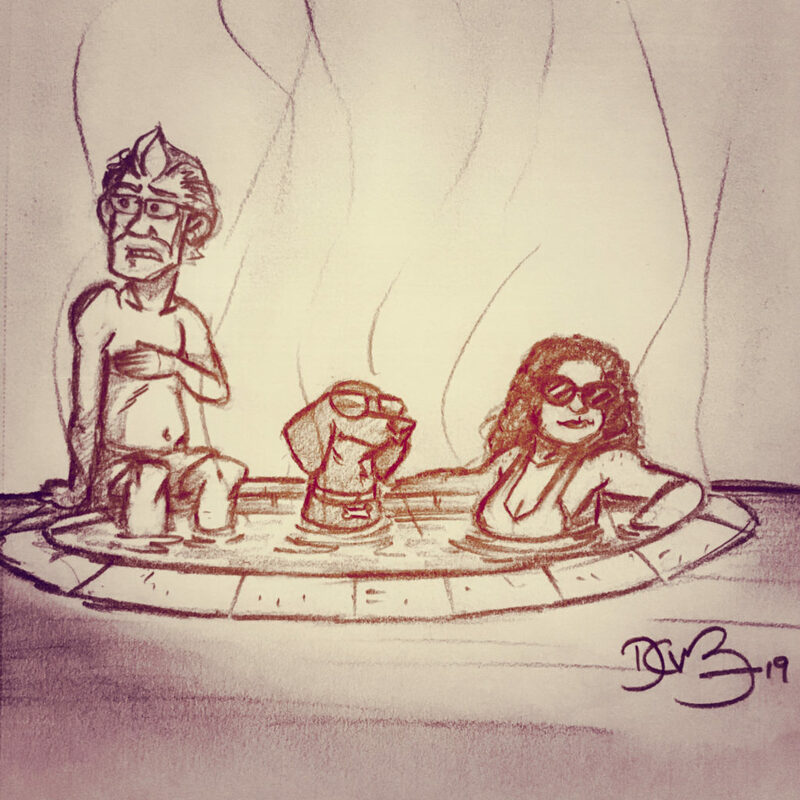 The illustration above was the image I had in my head when the plans were made: chilling together (and, if possible, with our dog, Rusty) in a natural hot spring and relaxing. It didn’t go according to plan on this trip––hot springs are expensive, weather was tumultuous, the dog likes swimming more than just chilling––but the sentiment remained and, like always, we made our own fun. This trip commemorates the eighteenth year Nicole and I have been together––eighteen years together, eight years married (we got married on our tenth anniversary as a gift to ourselves)––and I couldn’t imagine a better place to spend it and, of course, no better person to spend it with. 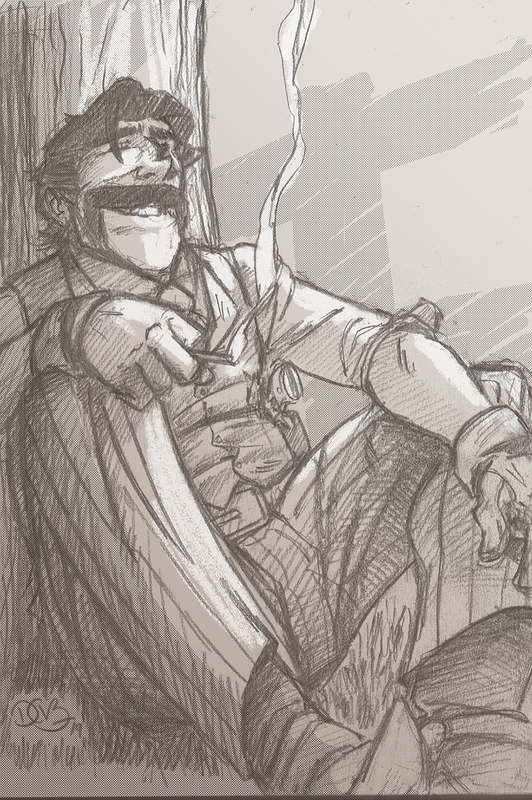 Part of me argues that, were I to start all over again, Juan John should be the main character of an on-going western comic. He’s naturally more charismatic and interesting than either Long John or Jonny Mono, with a built-in history with honest stakes attached to his livelihood that makes his story immediately more tragic, dramatic, and fun to watch unfold. So, I killed him in Chapter 3. Maybe that was a mistake on my part. Maybe that was an attempt for me to cover my mistakes. Overall, it permanently cast the character into a prison of “what if” proposals which––to me, at least––makes his death even more sad. 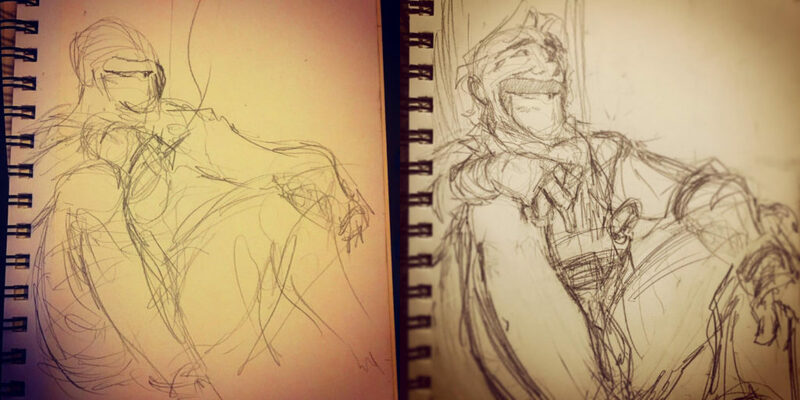 Instagram posts of the process of drawing this week’s Sketch Friday. Not for nothing, but I’ve been thinking a lot about death and memory lately––my immediate family suffered a shocking and sudden loss recently––and coming back to Long John has made the death of Juan hit even harder. I’m really proud of his arc in Chapter 3. Even though it’s short, I feel that Juan’s death hits hard and powerfully; though we only spent (according to the Characters page) 23 pages with him, it was enough to establish a noticeable presence and to immediately feel the absence of that presence once it was taken away. It wasn’t conscious to save his drawing in this apparent series of relaxed pencil sketches for last, but I’m glad it was. I was more active with promoting its creation on social media which, in a way, felt like a strange, ritualistic dance that brought Juan back from the void as I posted the process drawings. Sketchy at first, the details filled in as he found his way back, finding a way to be comfortable in––and with––his legacy, bringing with him everything that we lost in Chapter 3, captured in a single image. It’s nice to see Juan again. I’m glad he’s happy.